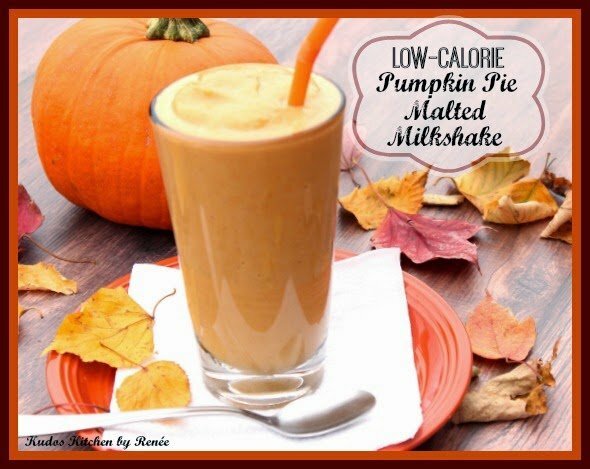 This Low-Calorie Pumpkin Pie Malted Milkshake is a creamy and delicious blend of pumpkin, low-fat vanilla yogurt, malted milk powder, vanilla and spices. What’s that you say? You love pumpkin pie but not all the calories that go along with it! 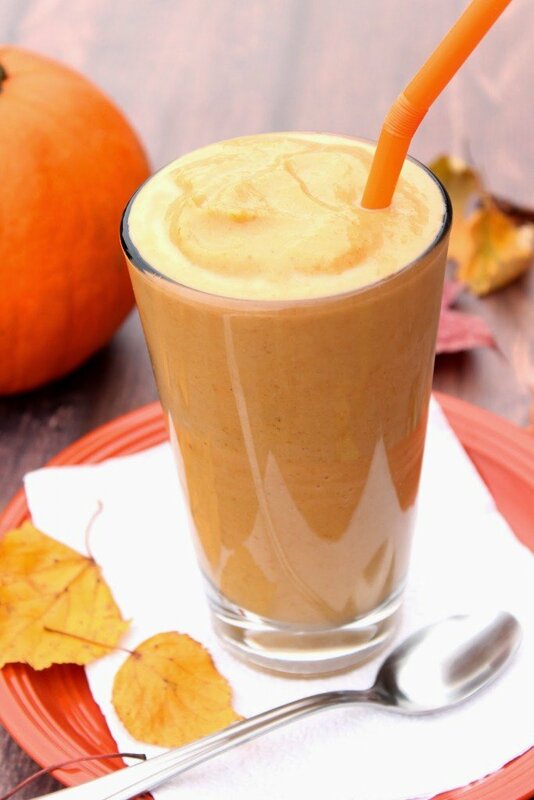 Well then, do I have a treat for you with this Low-Calorie Pumpkin Pie Malted Milkshake! Since this week’s #SundaySupper theme is “lighten up the holidays,” I thought this recipe would be appropriate. After all, what’s Thanksgiving without the taste of pumpkin pie? Since we are officially in the holiday season, the members of the Sunday Supper Movement are doing our part in trying to help whittle a few calories here and there to help us all through. While we’re not suggesting going through the entire holiday season eating healthy, low-fat and low-calorie foods (what kind of fun would that be?). What we are doing is giving you tasty options to cut back where, when and if you choose. -Place all the ingredients into a blender and blend until smooth. Awwww this sounds delicious! And it's perfect also for us down under, as it is a pumpkin cold treat, great for our warm weather! This sounds fabulous, Renee! And so thick that I could eat it with a spoon! What a terrific autumn flavor! It looks so rich and delicious!!! This is the perfect holiday treat! All those classic flavors without all the calories! What a great idea, my daughter would love this!! Love that you decided to make one of the world's heaviest drinks "light"! Looks yummy. What a lovely way to sneak some orange vegetable into dessert! Yum…this looks really good! I enjoy pumpkin most in the weeks ahead of Thanksgiving! I love this so much!!! Pumpkin pie is my favorite Thanksgiving dessert – unoriginal, perhaps, but true. A couple years ago I made a pumpkin pie milkshake, but I just chunked a piece of pumpkin pie in the blender along with milk and ice cream. So… yours is much healthier! I must try it this season! This will be perfect this coming week. I have a new blender and am making smoothies and such every day! I always forget about the malted milk powder in our pantry. My hubby would love this! Yum!! This will totally satisfy my pumpkin-loving sweet tooth! Oh. My. Heavens. This looks AMAZING!!! Yum yum yum! This looks fantastic, I love pumpkin and ice cream together. Okay, Renee. I'm officially smitten. Thanks for sharing this with #SundaySupper. I'll make this soon. A low calorie milkshake? I'm in! Love this, Renee! A welcome change from all the pumpkin pie lattes and such that are so typical for the season. Ohhhh, yes! Malted milkshakes are my FAVORITE, and I am totally digging the sound of this pumpkin one. Sounds like we need to make a birthday toast with two full glasses! 😉 Hope your day is fantastic, Renee. Wow! Malt AND pumpkin!? How seasonal of you! Thank you for sharing! 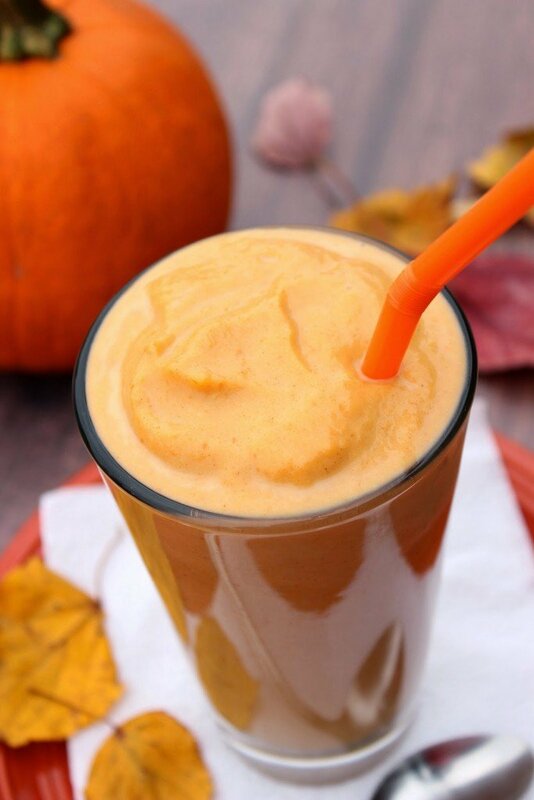 What a fun way to enjoy the flavors of pumpkin pie without breaking the calorie bank! Oh my goodness. I'd love one of these right now! Ahhh this is great for the fall! Pumpkin pie in a glass! This looks so satisfying and low calories too? Fantastic! Lightened up, you say? Looks indulgent to me!! Gosh, when will we have a future where I can ask for something and it will materialize in front of me? 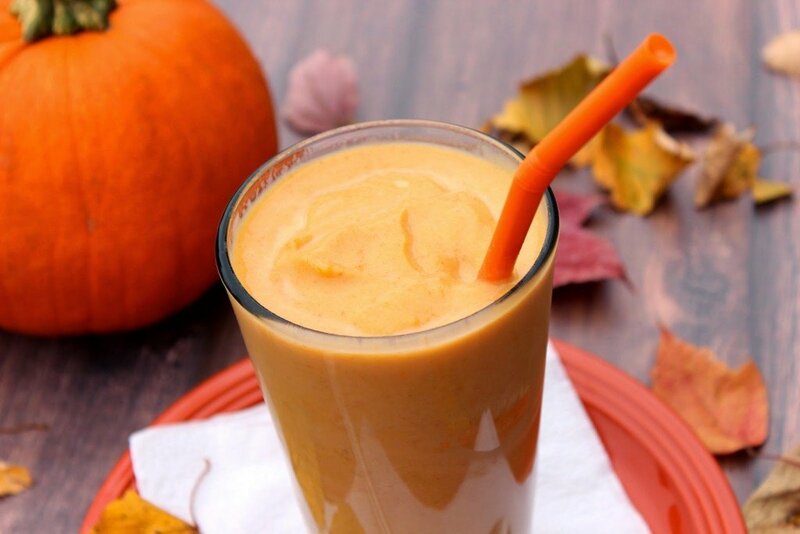 Such a great way to get your pumpkin fix without breaking the calorie banks! This milkshake looks amazing! I love that you threw in a little bit of that pumpkin pie flavor…yum! I love malted milk powder. This recipe sounds amazing! I love malt. I never mixed it with anything but chocolate or coffee before. Great idea! mmmmm I that I'll have this WITH some pumpkin pie hee hee. Love it! Shut the front door, this is amazing. I am so blown away by this one. Sounds fantastic! I could definitely do well sipping on one of these malts. Love the recipe, i thinks its healthy and easy to make as well.